Russian Oligarch Roman Abramovich is arguably the world greatest spender on yachts having spent over $1.5 Billion on purchase and maintenance of over five mega yachts in the last ten years. The Chelsea of England Football Club owner gave a name to his yacht collection which he called the Abramovich navy. His favorite yacht called Eclipse is the world largest Private Super yacht and also the second most expensive with a price tag of $700 million after the Golden History Supreme yacht worth $4.5 billion, plated with over 100 000 kg of gold owned by Malaysian billionaire Robert Kuok. Here is the countdown of the top Five of Abramovich yachts. Sussurro is 50 meters long and built by The Feadship De Vries Shipyard in 1998, Sussurro offers accommodations for up to 12 guests in 5 suites comprising of 1 owner cabin, 1 double cabin, and 3 twin cabins. She is also capable of carrying up to 11 crew onboard to ensure a relaxed luxury yacht experience. This mega yacht has features like swimming pool, Jacuzzi, spa and has a maximum speed of 46 knots. Terence Disdale is responsible for her beautiful exterior and interior design. The 88meter Motor Yatch Built in 2004 by Feadship, the interior and exterior design are by Terence Disdale. Ecstasea is capable of 28.00 knots flat out, with a cruising speed of 25.00 knots. accommodations for up to 14 guests in 7 suites comprising of 1 owner cabin, 4 double cabins, and 2 twin cabins. She is also capable of carrying up to 25 crew on board to ensure a relaxed luxury yacht experience. Pelorus is a 115meter mega yacht built by lurssen yachts in 2003. Elegant Exterior from Heywood designs and Interior by Terence Disdale Designs. The mega yacht also has a large pool, Jacuzzi, and numerous toys and tender on board. Pelorus can reach a top speed of 20 knots and cruises comfortably at 18 knots. She is equipped for long-distance cruising, with a range of 6000 nautical miles at 16 knots. 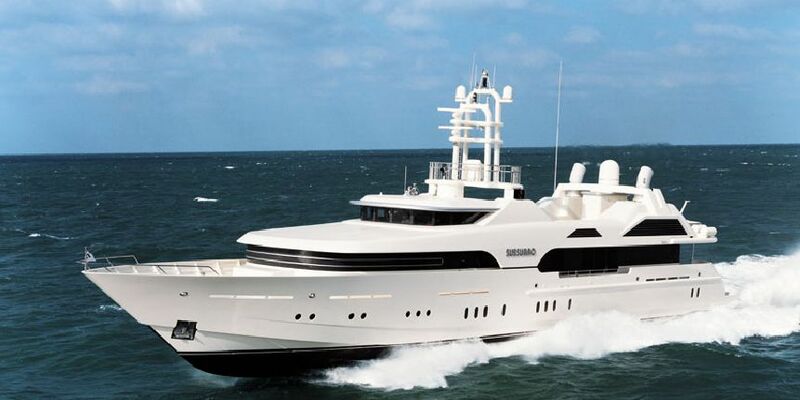 American Entertainment Producer David Geffen is currently in talk to purchase the Yacht. Eclipse is the world largest private yacht, at 163.5 meters long. The yacht was built by Blohm + Voss of Hamburg in Germany. Its exterior and interior were designed by Terence Disdale Design and its naval architect was Francis Designs. Has bullet proof windows, advanced missile detection system and a provision to escape via submarine located at the bottom end of the yacht, 2 swimming pools and 20 water-jet skis. Can Accommodate a 20 guest and crew of 60 and maximum speed of 26 knots.